What am I talking about you ask? 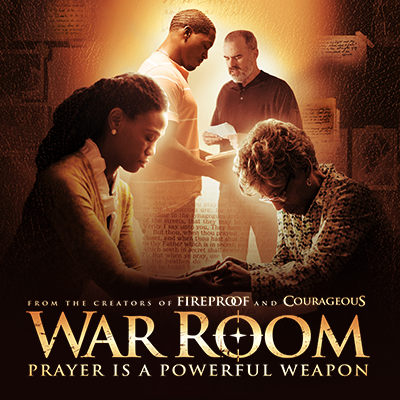 Only the #1 movie playing in theaters right now, “War Room” a movie centered around Tony and Elizabeth Jordan who seem to have it all; great jobs, a beautiful daughter, and their dream house. But appearances can be deceiving. Tony and Elizabeth’s world is actually crumbling under the strain of a failing marriage. While Tony basks in his professional success and flirts with temptation, Elizabeth resigns herself to increasing bitterness. But their lives take an unexpected turn when Elizabeth meets her newest client, Mrs. Clara, and is challenged to establish a “war room” and a battle plan of prayer for her family. As Elizabeth tries to fight for her family, Tony’s hidden struggles come to light. Tony must decide if he will make amends to his family and prove Mrs. Clara’s wisdom that victories don’t come by accident. In this scene from War Room, the new Kendrick Brothers’ movie, Miss Clara (Karen Abercrombie) encourages Elizabeth (Priscilla Shirer) to turn up the heat in her spiritual life. I grew up in church, broke my teeth in on the back of a pew as they say. Married a PK (preachers kid) did everything that I thought was right. Like many, I was hurt by the actions of others, let people get in my way and became one of those “lukewarm christians.” Lukewarm, doesn’t work folks. If you are wondering why things aren’t working out in your life, why prayers are not being answered, take a look at yourself. Are you lukewarm? Live, Laugh & Eat Healthy!